For the last few weeks, I have been listening over and over to the CDs of Mevaser Tov, the Good News Choir of Chana Yael Abramson of Givat Assaf and Ruti Sofer of Jerusalem. Such exquisite, soul-moving songs (you can listen to some of my favorites below). I was born in Atlanta, but have spent most of my life in Israel. I am a full-time mother of 7 children. My oldest is 18 and my youngest is 3 weeks! In addition to family, on the side, the greatest loves of my life are singing and learning Torah. 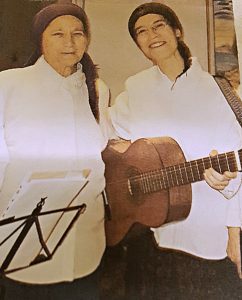 My partner in both is my dear friend, Ruti Sofer, whom I met around 20 years ago in a choir in which we both participated. Ruti and I live about an hour’s drive apart, but every week for many years we’ve gotten together to learn Torah together. Mostly we learn about emuna, about having faith. Ruti was close like a daughter to Rav Tsvi Yehuda, the son of Rav Avraham Yitzchak HaCohen Kook. Rav Tsvi Yehuda was like a father to Ruti, studying Torah with her and answering her many questions when she was becoming religious in her late 20s after growing up on a secular kibbutz. And, in turn, Ruti has been like a spiritual mother to me. When I learn with Ruti, I feel like I am learning with Rav Tsvi Yehuda zt”l himself, through her. She is the kindest, most giving person I know. 14 years ago, I gave birth to a baby boy. We named him Tuvia. I brought him to all my choir rehearsals, and I could see from his reactions to the singing that he was a musical baby. He was the choir’s baby! He smiled a lot and brought so much joy to people and spread good just with his mere presence. When Tuvia was 15 months old, we found out that he wasn’t as healthy as we had previously thought. Within 2 weeks, Tuvia was gone. Looking back, we understand that Tuvia was sent to this world to accomplish a mission for the 15 months he was supposed to be here, and it was an act of kindness that Hashem took him so quickly so that he and we didn’t suffer more than we did. After Tuvia died, one of the messages I took for myself is that Hashem gave me a gift, my ability to bring inspiration and joy to others with my singing. And this is a gift I need to share with others and not keep to myself. If we know somebody is not feeling well and in bed, we call her up and sing her a song for 2 minutes to lift her spirits. We sing for my grandmother, who is 96. We sing at senior citizens clubs. Wherever we are invited, we go! We sing Jewish songs, holy songs that are healing for the soul. So far we have recorded around 90 songs, and we distribute our CDs for free so our music reaches more people. 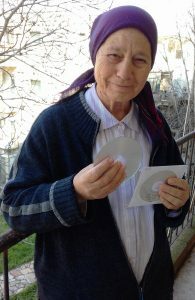 Ruti always carries CDs in her purse to give away to women in need of inspiration. Singing has brought me a lot of pleasure. I feel it has accompanied me, through the good times as well as the saddest times of my life. I feel that Tuvia’s soul is happy that I am continuing to sing, for him. And that Ruti and I are continuing to spread his special light to the world. Here’s some of my favorite songs from Mevaser Tov. For women, girls, and boys under 9. So beautiful! I have listen the songs again and again! Wish them a lot of happy occasions and meaningful hours together! This is so Hashgacha!! I was just thinking about Chana Yael and wondering what happened to her. 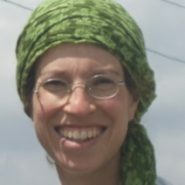 I dont know if you know but she use to live in Kiryat Moshe and she was one of the first people I met when I moved here. I must of met her after her son passed away which I never knew about, I thought she was someone with only one child. So happy to hear she has so many BH! Thank you for posting this. She is an amazing person. I remember Chana Yael from when I was in Machon Gold and later when I lived in kiryat moshe! She would go everywhere with her guitar, beautiful voice and ever-present smile! What a special woman! Thanks for sharing her music!